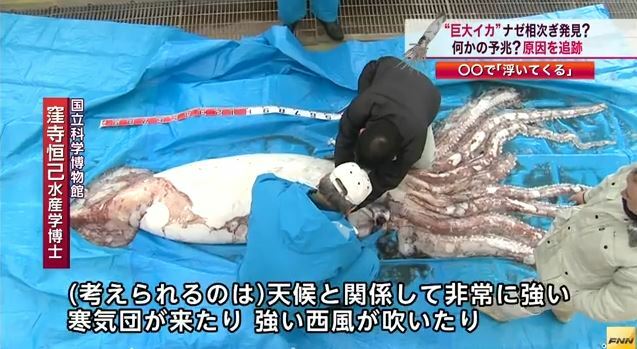 A rare, giant squid was caught by a fisherman in Japan. There have been recent reports about a radioactive squid, however those were false. This thing sure is real, they have the YouTube video to prove it. The well-known giant squid has always been a legend and rarely caught by humans. This one was netted by Shigenori Goto and it’s claimed to be 350 pounds and measures 13 feet long! Goto, who was fishing for yellowtails when he made his surprising catch, noticed the huge male squid around 7 a.m., according to the Japan Daily Press. Although alive at the time of its capture, the squid died soon after coming to the surface, the fisherman said.